The holidays. 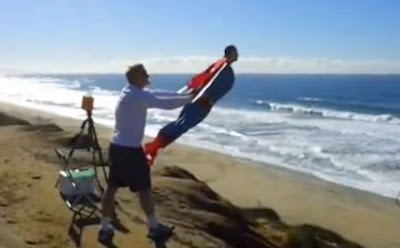 What a great time of year to go for a drive along a picture perfect coastline, marvel at what a beautiful world it is, and wave at Superman as he overtakes you, flying overhead. Now if that last sentence sounds like Dan is still hogging the eggnog you can imagine what these guys thought when doing exactly that, a radio controlled Superman flew past them. In the DC universe, Superman at the beach generally means Brainiac's about to gatecrash your picnic. Here, tracing said RC 'toy' back to it's source, it just redefines 'New Years awesome' all over again. Whoops--from the wording of the YouTube statement, it looks like TPTB weren't as pleased with this fan's efforts as the rest of us! Not sure what TPTB were behind this, but whichever quite frankly stink.